The Convert Anchor Point tool in Adobe Illustrator now works to reshape path segments as well as anchor points. This makes it easier than ever to alter the shape of a selected object in ways that were never before possible. Jeff Witchel introduces the reinvented pencil tool in Illustrator CC. The pencil tool now includes fidelity options that allow for creating smoother, cleaner paths. This new option allows users to change the corners of an object by first selecting it with the direct selection tool and then using Illustrator’s new corner options. Tool settings include radius, corner type, and rounding. It is also possible to just select and adjust one corner. 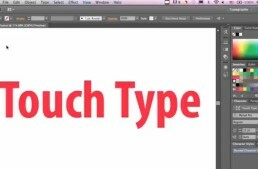 Adobe certified instructor Jeff Witchel shows what the power of Touch Type Tool can do. In this quick-tip video, Jeff will show you how the Touch Type Tool can manipulate the individual characters in type as if they were separate objects. Adobe certified instructor Jeff Witchel shows you how to sync your settings to the Cloud so you can have your personal settings on any computer that has Adobe Illustrator. Jeff shows you how the Cloud can sync your Preferences, Presets, Swatches, Brushes and more. When working with a complex Illustrator document with lots of objects, use the Selection menu to to make complex selections much easier. With the Creative Cloud, Adobe has added the package feature to Illustrator. Now, Illustrator can export all of your images and fonts used in your design into a folder that can be sent to your printer. It makes transferring a project that much easier. Jeff Witchel demonstrates the importance of layer organization when designing in Illustrator. The layers panel can be used to change stacking order and to manage the elements of a design.